Abstract: Bangladesh is commonly known as a disaster prone country and drought is one of the frequent natural phenomenon. A series of daily maximum temperature data from drought prone areas such as Bogra, Dinajpur, Ishsurdi, Faridpur and Rangpur districts over the period 1964-2013 years are analyzed in this study. For modelling purposes annual maximum temperature data fitted to generalize extreme value (GEV) distributions and block maxima approach are applied. The trend in GEV model also considers due to the existence of temporal trend in daily temperature data. Likelihood ratio statistics are used as a tool to compare models with trend and without trend. Drought risk is computed through the quantile of the best fitted GEV model which is popularly known as return levels. Sultana, N. (2016). Vulnerability assessment of drought prone areas of Bangladesh through extreme temperature modeling. Journal of Science, Technology and Environment Informatics, 03(01), 151-160. Sultana, N. “Vulnerability assessment of drought prone areas of Bangladesh through extreme temperature modeling.” Journal of Science, Technology and Environment Informatics, 03.01 (2016): 151-160. Sultana, N. “Vulnerability assessment of drought prone areas of Bangladesh through extreme temperature modeling.” Journal of Science, Technology and Environment Informatics, 03, no. 01 (2016): 151-160. Title: Presence of uranium and thorium in zircon assemblages separated from beach sands of Cox’s Bazar, Bangladesh. Abstract: Beach sands harbor appreciable amount of radioactive elements such as zircon which contains some important and radioactive elements (e.g. uranium, thorium). Very limited quantitative information is available of such elements in the sand of the beaches of Cox’s Bazar in Bangladesh. The present study presents application of Neutron Activation Analysis (NAA) to quantify uranium and thorium elemental concentration in zircon assemblages from beach placers of Cox’s Bazar. Zircon was separated from beach sands in a mineral processing pilot plant. The separated zircon assemblages were examined by a polarizing petrographic microscope and X-ray diffraction techniques and found that it contained more than 75% pure zircon. Thereafter, uranium and thorium concentrations in zircon were measured by NAA and revealed that zircon contained 94-141 ppm uranium and 127-506 ppm thorium. Therefore, this noticeable amount of uranium and thorium in zircon should be taken in consideration during any mining attempt of the placer minerals present in Cox's Bazar beaches. Zaman, M. M., Rajib, M., Kabir, M. Z., Deeba, F., Rana, S. M., Hossain, S. M., Latif, Sk. A. & Rasul, M. G. (2016). Presence of uranium and thorium in zircon assemblages separated from beach sands of Cox’s Bazar, Bangladesh. Journal of Science, Technology and Environment Informatics, 03(01), 161-169. Zaman, M. M., Rajib, M., Kabir, M. Z., Deeba, F., Rana, S. M., Hossain, S. M., Latif, Sk. A. & Rasul, M. G. “Presence of uranium and thorium in zircon assemblages separated from beach sands of Cox’s Bazar, Bangladesh.” Journal of Science, Technology and Environment Informatics, 03.01 (2016): 161-169. Zaman, M. M., Rajib, M., Kabir, M. Z., Deeba, F., Rana, S. M., Hossain, S. M., Latif, Sk. A. & Rasul, M. G. “Presence of uranium and thorium in zircon assemblages separated from beach sands of Cox’s Bazar, Bangladesh.” Journal of Science, Technology and Environment Informatics, 03, no. 01 (2016): 161-169. Authors: Islam, S., Parveen, K., Khan, M. I. K., Rahman, M. M. & Ahmad, F.
Authors: Rahman, M. B., Billah, M. M., Sakib, K. N., Malek, M. A., Hossain, S. D. & Haider, A. F. M. Y. (2016). Authors: Mairapetyan, S., Alexanyan, J., Tovmasyan, A., Daryadar, M., Stepanian, B. & Mamikonyan, V. (2016). Authors: Azad, M. S., Alam, M. J., Mollick, A. S. & Matin, M. A. (2016). Abstract: Clonal propagation is important for the conservation of native, wild and threatening tree species. The study investigates the opportunities of rooting of branch cuttings of Santalum album treated with 0, 0.4, 0.6 and 0.8% indole-3-butyric acid (IBA) in a non-mist propagator. A total of four hundreds eighty cuttings were used to assess the rooting ability of this species. The study revealed significant differences (p<0.05) of rooting percent, average root number per cutting and average root length among the treatments. Rooting success varied 1.32-fold (70-92.6%), 3.8-fold (5-19) and 3.1-fold (3.1-9.6 cm) in rooting percentage, average root number per cutting and average root length respectively among the treatments. The maximum and minimum rooting success were observed in T3 and T0 in all cases except in root number per cutting. In this case T2 performed better than others. The result exposed significant differences (p<0.05) of sprouting percent (1.32-fold: 62.3 - 83.3%) among the treatments but no significant difference (p>0.05) of number of sprouts per cutting (2.5-fold: 2-5) and number of leaves per cutting (1.7-fold: 10-17). Maximum and minimum sprouting percent was showed similar fashion of rooting percent. The results also exposed significant differences (p<0.05) of biomass production in adventitious roots and shoots among the treatments. Biomass production was significantly (p<0.01) higher in adventitious shoots than those of roots. The overall survival of rooted cutting was higher in control (90.56%) than others but showed no significant differences (p>0.05) among the treatments. It can be recommended not to use IBA for rooting of branch cuttings of S. album. Azad, M. S., Alam, M. J., Mollick, A. S. & Matin, M. A. (2016). Responses of IBA on rooting, biomass production and survival of branch cuttings of Santalum album L., a wild threatened tropical medicinal tree species. Journal of Science, Technology and Environment Informatics, 03(02), 195-206. Azad, M. S., Alam, M. J., Mollick, A. S. & Matin, M. A. “Responses of IBA on rooting, biomass production and survival of branch cuttings of Santalum album L., a wild threatened tropical medicinal tree species.” Journal of Science, Technology and Environment Informatics, 03.02 (2016): 195-206. Azad, M. S., Alam, M. J., Mollick, A. S. & Matin, M. A. Responses of IBA on rooting, biomass production and survival of branch cuttings of Santalum album L., a wild threatened tropical medicinal tree species. Journal of Science, Technology and Environment Informatics, 03, no. 02 (2016): 195-206. Authors: Mgbemena, N. M. & Obodo, G. A.
Abstract: Proximate and mineral compositions were carried out on the leaves, seeds and roots of moringa oleifera obtained from Okigwe, Nigeria. Mineral and proximate compositions were determined using their various methods of analysis. Results of proximate analysis in percentage showed moisture content in the following range; leaves 4.84, seeds 9.56 and roots 6.06, crude protein; leaves 24.94, seeds, 17.94 and roots 12.25, fat content; leaves 11.50, seeds, 12.60 and roots, 2.66 while mineral content still in percentage showed potassium in the roots 0.850, leaves 0.625, seeds 0.950 magnesium; roots 1.64, leaves 1.277 and seeds, 1.094 and calcium; roots 4.22, leaves 2.91 and seeds 2.61. These results showed that for proximate composition, the leaves had higher values followed by the roots and lastly by the seeds for most of the analysis while the mineral value contents showed higher percentages in the roots and the leaves .Even though all the various parts of moringa olerifera are nutritionally valuable the leaves and roots are highly recommended for their higher nutritional values. Mgbemena, N. M. & Obodo, G. A. (2016). Comparative analysis of the proximate and mineral composition of moringa olerifera roots, leaves and seeds obtained in okigwe imo state Nigeria. Journal of Science, Technology and Environment Informatics, 03(02), 207-212. Mgbemena, N. M. & Obodo, G. A. “Comparative analysis of the proximate and mineral composition of moringa olerifera roots, leaves and seeds obtained in okigwe imo state Nigeria.” Journal of Science, Technology and Environment Informatics, 03.02 (2016): 207-212. Mgbemena, N. M. & Obodo, G. A. Comparative analysis of the proximate and mineral composition of moringa olerifera roots, leaves and seeds obtained in okigwe imo state Nigeria. Journal of Science, Technology and Environment Informatics, 03, no. 02 (2016): 207-212. Abstract: The present study aims to contribute with new insights on three main current topics on builders used in laundry products: a) the search for a replacement to sodium tripolyphosphate, b) an efficient system that works under oxidative conditions and c) the effect of a co-surfactant. For regular laundry formulations, we found a non-expected synergistic system which can perfectly replace sodium tripolyphosphate at the same formulation cost. For bleaching formulations, we found one alternative builder for phosphonates replacement, and some natural materials which are worth to be further studied. We also found an unexpected protection effect of the main anionic surfactant when combined with the appropriate co-surfactant without the need of a builder. Cabrejos, W. (2016). Current topics on builders in laundry products. Journal of Science, Technology and Environment Informatics, 03(02), 213-219. Cabrejos, W. “Current topics on builders in laundry products.” Journal of Science, Technology and Environment Informatics, 03.02 (2016): 213-219. Cabrejos, W. Current topics on builders in laundry products. 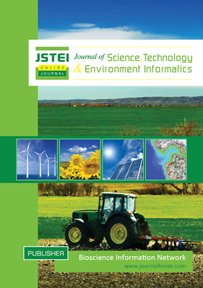 Journal of Science, Technology and Environment Informatics, 03, no. 02 (2016): 213-219. Authors: Islam, M. K., Molla, S. R., Rahman, M. M. & Roy, K.
Authors: Reza, M. S., Islam, A. K. M. S., Rahman, M. A., Miah, M. Y., Akhter, S. & Rahman, M. M.
Abstract: Goal of the study was to investigate nutrient uptake, growth and yield of the cabbage (Brassica oleracea var. capitata) variety‘Atlas-70’as influenced by the application of different organic fertilizers. Randomized complete block design (RCBD) comprising five treatments with three replications were executed to conduct the study. Treatments were T1= Soil Test Based 100% Recommended Dose of Chemical Fertilizer (RDCF), T2= 5 t/ha Cow dung (CD) + integrated plant nutrient system (IPNS) based Chemical fertilizers (CF), T3=5 t/ha Poultry Manure (PM) + integrated plant nutrient system (IPNS) based Chemical fertilizers (CF), T4= 5 t/ha vermicompost (VC) + integrated plant nutrient system (IPNS) based Chemical fertilizers (CF), T5= Absolute control. Results of the experiment showed that the same amount of N, P, K and S from cow dung, poultry manure and vermicompost showed significant differences (P≤0.05) on plant height, unfolded leaves, head circumference, marketable yield, total yield and nutrient content in cabbage. Organic fertilizers (cow dung, poultry manure and vermicompost) resulted better nutrient uptake as compared to the chemical fertilizers. However, vermicompost tended to be the potential organic source for higher yield and nutrient uptake of cabbage and thus is suitable substitute of the most commonly used nitrogen (urea) sources for the production of cabbage. Reza, M. S., Islam, A. K. M. S., Rahman, M. A., Miah, M. Y., Akhter, S. & Rahman, M. M. (2016). Impact of organic fertilizers on yield and nutrient uptake of cabbage (Brassica Oleracea var. capitata). Journal of Science, Technology and Environment Informatics, 03(02), 231-244. Reza, M. S., Islam, A. K. M. S., Rahman, M. A., Miah, M. Y., Akhter, S. & Rahman, M. M. “Impact of organic fertilizers on yield and nutrient uptake of cabbage (Brassica Oleracea var. capitata).” Journal of Science, Technology and Environment Informatics, 03.02 (2016): 231-244. Reza, M. S., Islam, A. K. M. S., Rahman, M. A., Miah, M. Y., Akhter, S. & Rahman, M. M. Impact of organic fertilizers on yield and nutrient uptake of cabbage (Brassica Oleracea var. capitata). Journal of Science, Technology and Environment Informatics, 03, no. 02 (2016): 231-244.